If you’ve been following my blog, you’ll know that I did a couple of craft fairs this season. Of course, that means making a lot of different things, and lots of each item, so you have enough to sell. One of the fun projects I did was making the Curly Paper Wreaths; I started doing these for myself years ago, so I decided to do a few for the craft fairs. They’re really easy to make, and a great way to use up your stash of our gorgeous Designer Series Papers!! 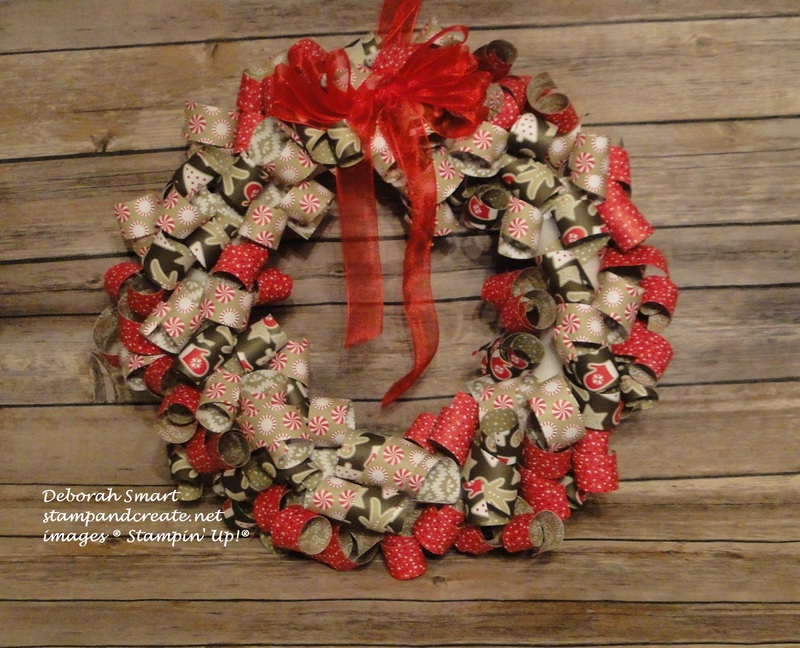 This wreath uses 3 different patterns from the Candy Cane Lane Designer Series Paper. 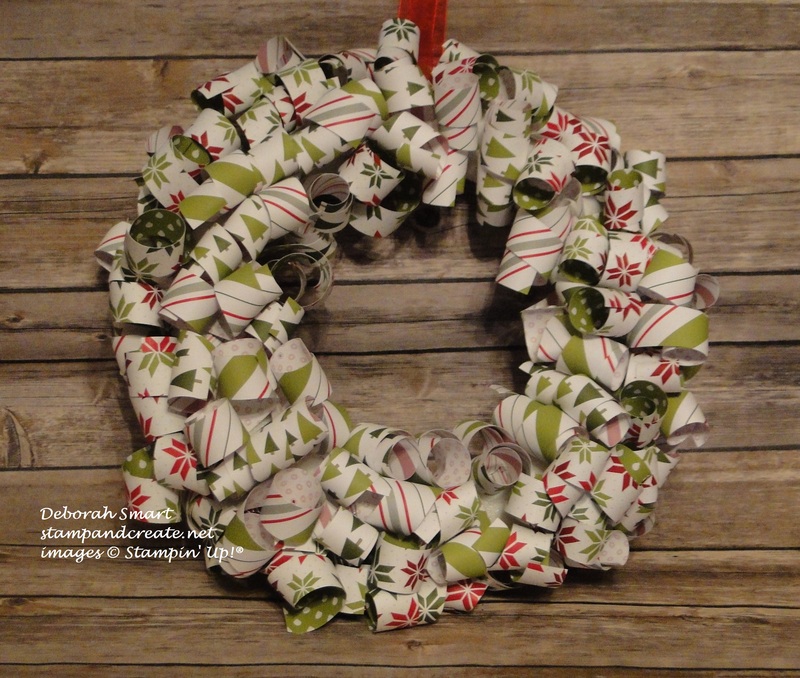 All you need are 6 pieces of DSP, a styrofoam wreath, and a whole lot of straight pins! DIRECTIONS: Cut the DSP into strips that are 1″ x 12″, then use your Bone Folder to curl each end of the strip (hold it firmly in the middle, then curl first one end, then the other). 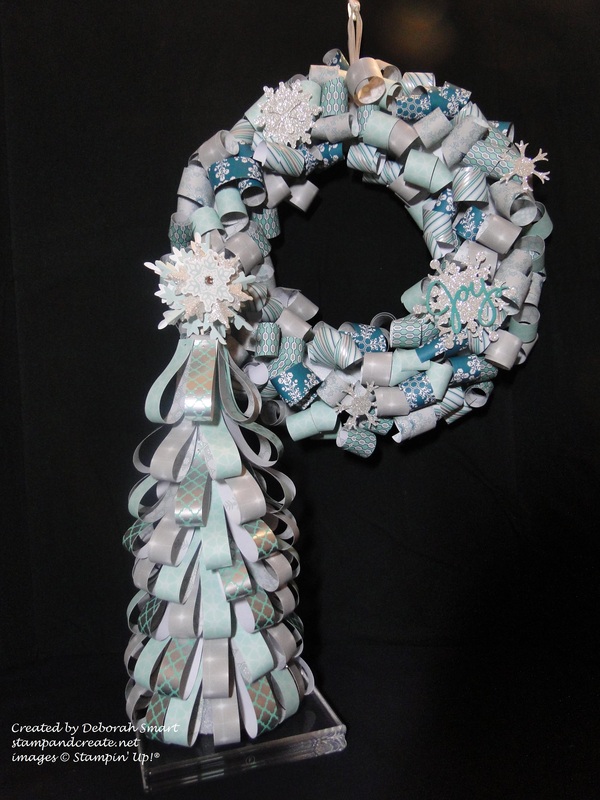 Then put the straight pin in the middle of the curled paper, and attach it to the styrofoam wreath. I added some die cut snowflakes and the die cut ‘Joy’; I also made a small tree by adding loops of DSP to a styrofoam cone shape, and added some die cut snowflakes on the top. So you can see that there’s a lot more to using Stampin’ Up! products that just card making or memory keeping 🙂 I hope my post has inspired you to get creative with your supplies too! Remember that the Year End Closeout is still happening – the Candy Cane Lane DSP has now sold out, but you can still get other DSP on sale! Just click on my signature below to order yours now! Until next time – happy crafting & stamping! Next Next post: LAST DAY FOR CHRISTMAS DELIVERY! Year End Closeout Ending Soon!